The partnership between The Nature Conservancy and Northwestern combines complementary research efforts to support urban sustainability and biodiversity on regional, national, and global scales. The agreement, led by ISEN, leverages cutting edge technology and public engagement to assess and address water management issues in the Midwest region. Indian Boundary Prairies: TNC and ISEN are working with Argonne National Laboratory to monitor land and stormwater catchment at the Indian Boundary Prairies. 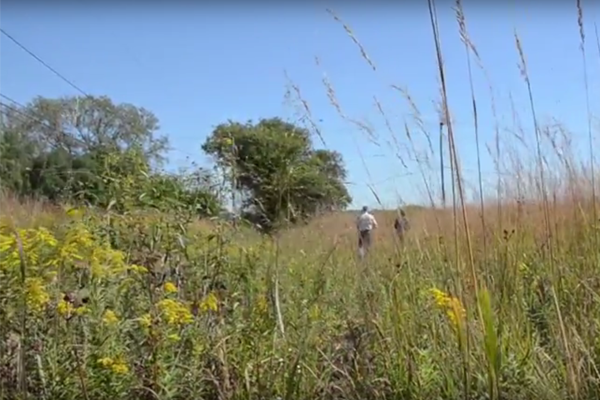 The study is using technology developed at Argonne to monitor how the preserve’s prairies can help manage Chicago’s stormwater runoff and alleviate flooding for nearby residents on the Chicago's South Side. Sensor nodes developed at Argonne are measuring a variety of hydrological factors including soil moisture, water levels, and stormwater impacts. TNC Leadership on Northwestern Executive Council: Director of the Illinois Chapter of TNC Michelle Carr has been a member of the Executive Council at ISEN since 2015. ISEN's Executive Council is an advisory board of renewable energy executives, conservationists, and cleantech entrepreneurs. Council members bring financial resources to ISEN and advise the leadership team and university decision makers on industry trends and policy. Northwestern Leadership at TNC Illinois: Northwestern Professor Bill Miller of the Department of Chemical and Biological Engineering has been a member of the TNC Illinois Science Advisory Committee since 2016 and was appointed to the TNC Illinois Board of Trustees in 2018. TNC Visiting Scholar Appointment at Northwestern: Jeff Walk, Director of Conservation for TNC’s Illinois Chapter, was appointed as an ISEN Visiting Scholar in 2017. This virtual appointment allows Walk access to vital Northwestern resources in support of his research relating to large-scale floodplain restoration in the Illinois River Valley and related issues. John Legge, Chicago conservation director at TNC, has also recently been appointed as an ISEN Visiting Scholar. Climate Change and Global River Systems: Colin Philips, a postdoctoral fellow in Northwestern’s Department of Civil and Environmental Engineering, was awarded a TNC NatureNet Fellowship to assess how climate change, land development, and hydropower development alter the timing, magnitude, and duration of river flow and sediment erosion. Based in Colombia’s Magdalena River Basin, Philips is working with Professor Aaron Packman (Civil and Environmental Engineering and Director of the Center for Water Research), Assistant Professor Daniel Horton (Earth and Planetary Sciences), and TNC global water system specialists. Community-based Research on Green Infrastructure: Vidya Venkataramanan, a postdoctoral fellow in Northwestern’s Department of Anthropology and Center for Water Research, was awarded a TNC NatureNet Fellowship. The Fellowship will support her research in determining communities’ experiences and coping strategies for chronic urban flooding in Chicago and its suburbs, and the perceived value and effectiveness of green infrastructure for mitigate such flooding. Protecting Cities from Extreme Weather Events: Researchers from Northwestern, the University of Illinois, and Argonne National Laboratory are working with TNC and the City of Chicago to mitigate the effects of extreme weather events on cities across the globe. The team recently received a grant to initiate their project, Systems Approaches for Vulnerable Evaluation and Urban Resilience (SAVEUR), which aims to more accurately predict extreme weather events and reduce impacts at the neighborhood level. Article: "New Collaboration Examines Community Impacts of Green Infrastructure"
Article: "NatureNet Fellowship Advances Northwestern University Partnership With The Nature Conservancy"
Article: "Nature Conservancy Partnership Grows With Board Of Trustees Appointment"
Article: "ISEN Welcomes Michelle Carr to Executive Council"
Article: "Prairie Plays Key Role in Chicago's Flood Management"
Article: "Technology Revolutionizes Stormwater Study at Indian Boundary Prairies"
VIDEO: Learn about ISEN's partnership with The Nature Conservancy.